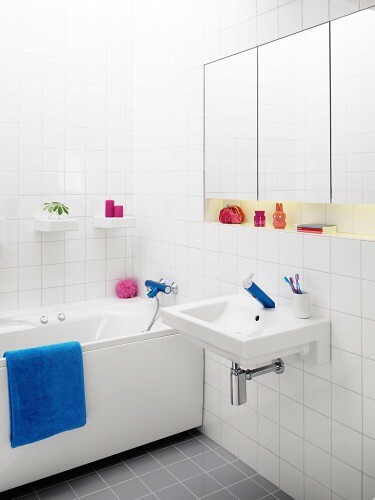 Bathroom interior with Coloric mixers, upload feito originalmente por Gustavsberg. Gustavsberg’s brand new collection Coloric is unique as it is the first aluminium mixer collection ever on the market. Elegant design, cool colours and environmental friendliness are all combined in Coloric. The Coloric mixers are made of coloured aluminium without lead and can therefore be recycled. The Coloric taps are also equipped with water saving technique. On this picture you can see blue washbasin mixer and blue bathtub mixer.